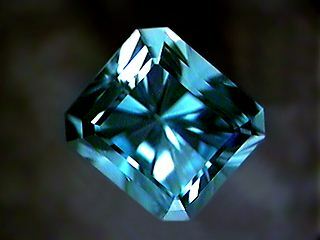 Blue topaz; photo © theimage.com (noncommercial use permitted with attribution). The Lone Star cut, designed by two native Texans, is a special gemstone cut that reflects a five-pointed star (the Lone Star of Texas). Topaz comes in all colors; a golden orange-yellow (called "imperial topaz") is considered the most valuable. 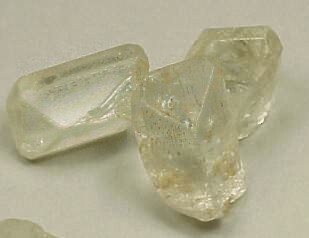 Topaz is commonly thought of as a sky-blue gem, but a deep blue hue is rare in nature (colorless and light-hued stones are heat-treated to achieve the blue color). The largest gem topaz deposits are in Brazil and Russia. Other locations include Mexico and the USA (Texas, Colorado, Utah). RESOLVED, By the House of Representatives of the State of Texas, the Senate concurring, that the recommendations of the Texas Gem and Mineral Society be and are hereby adopted, and that the TEXAS BLUE TOPAZ be and is hereby declared to be the official State gem and PETRIFIED PALMWOOD be and is hereby declared to be the official State stone of Texas. 1. Cut 10 facets at 45°. Index 4-12-20-28-36-44-52-60-68-76. 2. 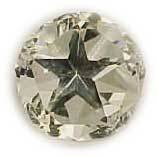 Cut 5 facets at 54°, until the star is a measured 65 percent of the diameter of the stone. Index 80-16-32-48-64. 3. Cut 10 facets at 60.7°. Index 2-14-18-30-34-46-50-62-66-78. These are to meet the points of the star exactly. 4. Cut 5 facets at 65°. Index 8-24-40-56-72. These should also meet the points of the star exactly. 5. Prepolish in the same order, then polish from the culet to the girdle. 1. Cut 10 facets at 41.5° Index 2-14-18-30-34-46-50-62-66-78. These should be cut until the girdle is of the proper thickness. 2. Cut 5 facets at 52.1°. Index 8-24-40-56-72. Cut these until they match the corresponding facets of the pavilion in width at the girdle. This will insure the proper size for the table. 3. Cut 5 facets at 30°. Index 80-16-32-48-64. 4. Cut the table at 0° until the 30° facets meet at a point. 5. Prepolish in the same order, then polish in reverse order. If desired, the table may be cut and polished last; it depends on your machine. The girdle may be polished or not, as you wish. Natural topaz with lonestar cut; photo © Darmar Gemstones (all rights reserved; used by permission). Rough pieces of topaz; photo © Darmar Gemstones (all rights reserved; used by permission).